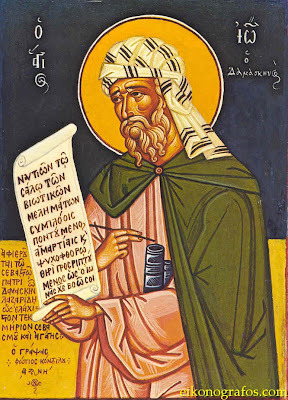 "The great defender of the Orthodox Faith against the Iconoclasts, our righteous Father John of Damascus (See Dec. 4), was slandered to the Caliph of Damascus by the Iconoclast Emperor Leo the Isaurian (reigned 717-741). Saint John was accused of sedition and his right hand was cut off. 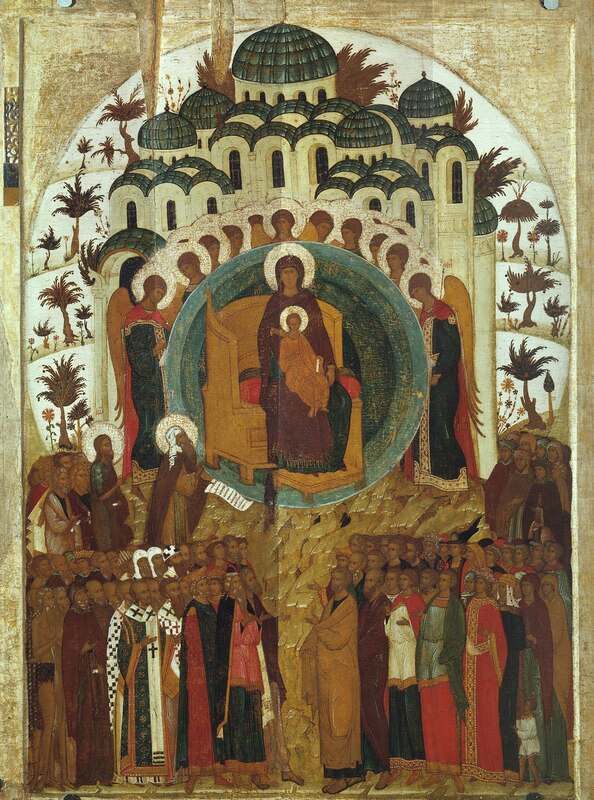 Having asked for the severed hand, Saint John passed the night in great pain, praying for the aid of the most holy Theotokos." "Awaking from sleep, he found that his hand had been miraculously restored, with only a red scar about the wrist where it had been severed, as a testimony to the wonderous healing. 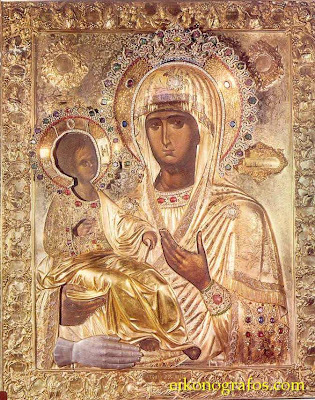 In thanksgiving, he had a silver hand attached to the icon to commemorate this great miracle." 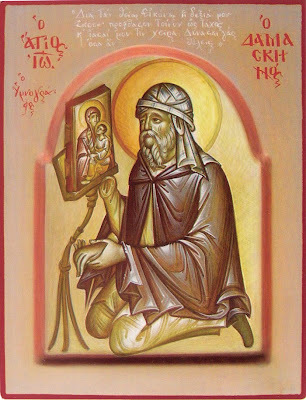 "On becoming a monk in the lavra of Saint Sabbas the Sanctified in the Holy Land, John brought the icon with him. There it remained until the thirteenth century, when it was given to Saint Sabbas of Serbia (see Jan. 14), who brought it to Serbia, where it remained for a time. Later, it was miraculously transported by an unguided donkey that carried it to the Serbian Monastery of Hilandar on the Holy Mountain, Athos, where it remains to this day." Note: the full service of the Tricherousa Icon of the Theotokos (in Greek), is available here: http://voutsinasilias.blogspot.com/2009/07/12.html.